The stretch of land in the Northern Highland on which Glenmorangie stands has been the site for alcohol production (mostly illicit) since the Middle Ages, setting a formidable legacy. Glenmorangie was founded in 1843, although operation didn’t start until 1849. Glenmorangie has a wide selection of official bottlings for those wishing to expand their single malt experience. The backbone of their official range is The Original, which is aged for ten years. The official range also includes an 18 year old and a 25 year old bottling, as well as a variety of wood finishes with an age of typically 12 years, and distiller’s editions. There are close to none independent bottlings of Glenmorangie available, and tracking them down on the market is challenging. An unusually high percentage of the single malt produced at Glenmorangie is actually bottled and sold as single malt. The production capacity of the distillery stands at six million liters, and the water used in the production is drawn from Tarlogie Springs, which are located in the nearby Tarlogie hills. The production is supported by an enormous mash tun, which can hold up to 12 tonnes. Over the years, Glenmorangie has become Scotland’s best selling single malt. That, more than anything else, should be held dear to the distillery’s metaphoric heart as an enormous success. 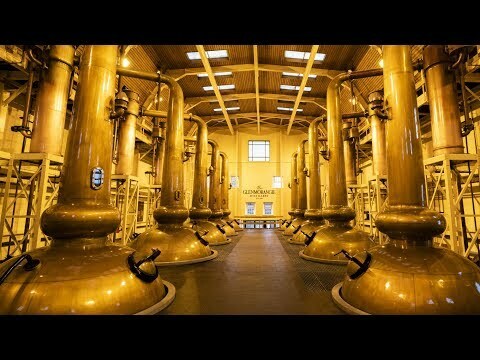 The huge-scale production at Glenmorangie is supported by eight stills: four wash and four spirit. The wash stills each have a production capacity of 12’500 litres, while the spirit stills have an 8’000 litre capacity. The original pair of stills were expanded to four in 1980, and doubled again to a total of eight in 1990, and finally expanded to ten. The stills are heated by electric and oil steam coils. All of the stills have a unique tall shape, with round spherical lids and a tall, vertical neck reaching straight up from the lid. They also use reflux bowls to increase the reflux at the lower end of the tall necks. Glenmorangie actually used to have the tallest stills in the business (they stand at 16 feet and 10 inches). The extra height in Glenmorangie’s stills ensures that much of the distillate runs back down the neck before exiting through the lyne arm. This process is known as 'reflux', and results in a very smooth and mild malt whisky. Glenmorangie decommissioned its floor maltings in 1977. Since then, the maltings have been bought from Murray Firth in Inverness. The maltings used in the production are very lightly peated. The kind of barley which Glenmorangie uses in the creation of it’s malting is Derkado barley, which has been carefully selected to give Glenmorangie it’s distinctive taste. One of the most impressive features of Glenmorangie is that the distillery still uses earthen floor warehouses. The distillery has fourteen on-site warehouses: ten dunnage, four racked. The distillery mainly uses American Oak casks, and a combination of different woods, including Sherry, Port, and Sauternes, are used for the range of 'Wood Finishes' bottlings. The casks at the distillery were formerly reused up to three times. From the 2010s on, they reduced to a two times usage to increase quality. Glenmorangie is one of the most innovative distilleries in Scotland when it comes to experimenting with different finishes. Indeed, Glenmorangie can be credited with the popularization of 'finished malt whisky'. The stretch of land in the Northern Highland on which Glenmorangie stands has been the site for alcohol production (mostly illicit) since the Middle Ages, setting a formidable legacy. Glenmorangie was founded in 1843, although operation didn’t start until 1849. The founders were the brothers John and William Mathesen who had a history in whisky production. Production got off to a successful start, and in 1887, the Glenmorangie Distillery Company Limited was founded. In 1880, exportation commenced at the distillery, which went extremely successfully. In 1918, 40% of the distillery was sold to the Glenmorangie Distillery Company Limited’s largest customer, Macdonald and Muir, and 60% was sold to Durham, a whisky dealing company. Production continued successfully under its new ownership, with Macdonald eventually taking complete control of the distillery. In 1931, due to the great pressure that the global financial depression and American Prohibition act put on the whisky industry, the distillery was forced to close. After being mothballed for five years, the distillery was reopened in 1936, with production resuming immediately. Production continued to go on to acclaim and financial gain, and in 1980, the number of stills was doubled to four in order to handle the increase in demand. Ten years later, the number of stills was doubled again, this time to a total of eight stills. In 1994, a visitor’s centre was opened at the site, and the Glenmorangie Port Wood Finish was released, which marked the beginning of a new era of wood finishes being released from the distillery. In 1997, a museum was opened at the site, dedicated to the history of Glenmorangie and single malt production. In 2004, the Macdonald family decided to sell Glenmorangie, as well as the other distilleries that they owned, including Arberg which comprised 'Glenmorangie plc'. The bidding war over the company was absolutely frantic, with Moet Hennessey emerging triumphantly. Moet Hennessy launched a complete re-vamp of the Glenmorangie brand, discontinuing the 15 and 30-year-old bottlings, and totally re-naming the other bottlings. Glenmorangie has continued to go from strength to strength under Moet Hennessey which are owned jointly by Diageo (34%) and LVMH (Louis Vuitton), having managed to scale up its production to a truly competitive level without undermining the quality of the single malt. Glenmorangie houses both a visitor’s centre, which offers tours of the facilities, a café and gift shop, and a museum dedicated to the history of Glenmorangie and the production of single malt whisky. Share your experience with other whisky lovers. Write a note about your trip to the Glenmorangie distillery.